If you run Google Adwords PPC ads for your business, you might think to yourself, I wonder how much I am getting from my ads? With the data you get in your Adwords account and your Analytics, you can see website traffic and conversions resulting from the clicks on your ads. But how about any calls that you get directly from your ads? Such as when someone sees your ad on their mobile phone and then calls you directly. This is a topic I’ve been meaning to delve into for a while. 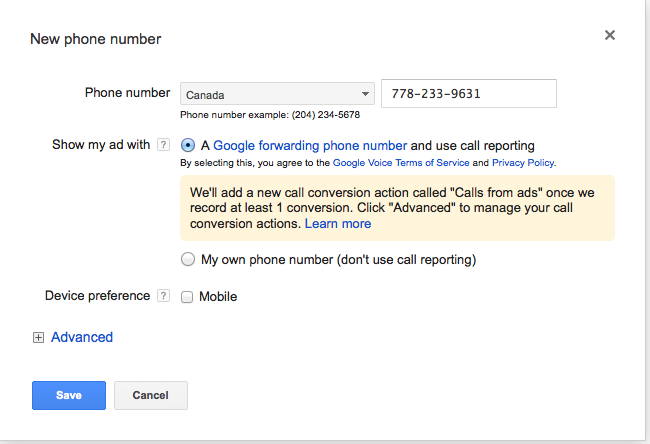 Last fall call tracking rolled out to Canada and I thought it was a good opportunity to bring up this feature of PPC advertising. And then I got the email from Adwords in regards to their forwarding numbers being automatically rolled out and I figured that some of you might be wondering what this is all about. Before continuing on here, you need to think about how important phone calls are to your business. If they are not important, then you can probably just skip this post altogether. If on the flip side, calls are hugely important to you, then you want to make sure that you are facilitating and encouraging the phone call with your ads, and that you are gathering as much data as possible to help guide your marketing. What are Google forwarding numbers? 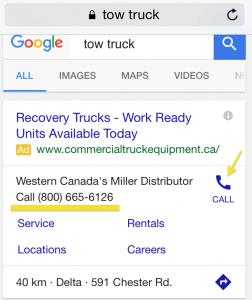 They are unique phone numbers that Google assigns to your ads, but that go to your actual phone number. When someone sees your ad on a mobile device, a “Call” button will show up, allowing the person to click to call you directly. The forwarding numbers allow you to track specific data such as when calls were made, where they were made from and which keywords drive the most calls. Note that this feature only works in certain countries at the moment, including Canada, the US, the UK and Australia. See the full list here. Google will make the number reflect a local number that aligns with your current number and location where possible. What are call extensions and how can I set them up? You can’t actually include a phone number in your ad text, so if you want your number to be included, you need to use the call extensions feature. You can either set this up for all of your campaigns, or just click on a specific one. 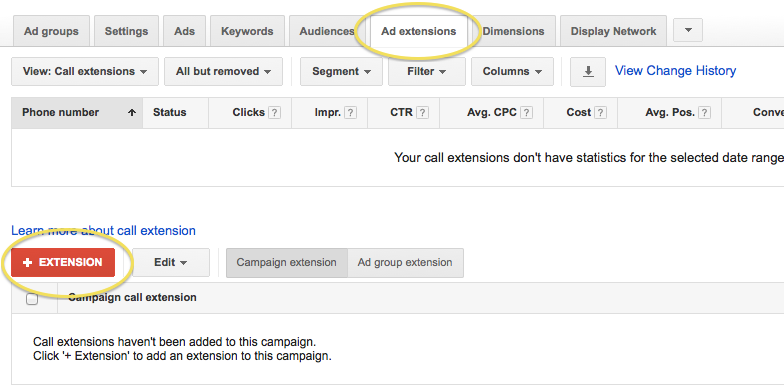 Click Ad Extensions in the top navigation and ensure that in the View box you have Call extensions. Click on the big red button Extension. 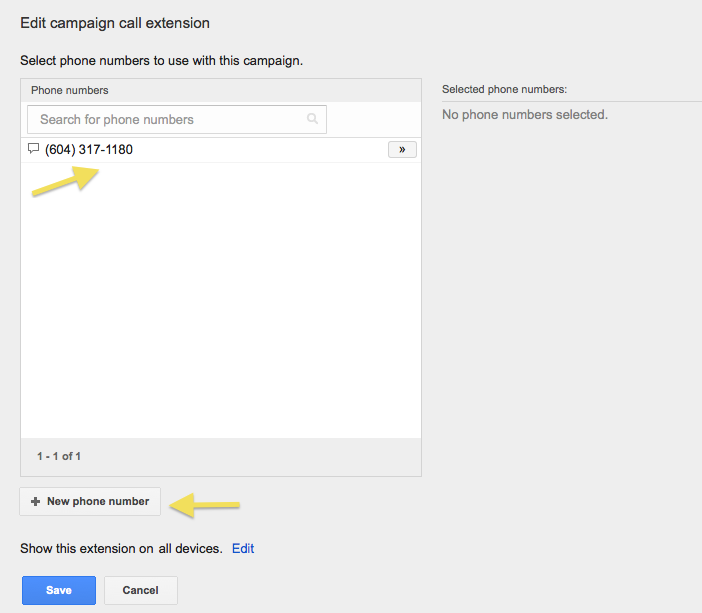 If you have a phone number set up in a different campaign, you have the option to add it, or you can add a New Phone Number. In the pop up window, add in your number. As you can see here, if you don’t want to use call forwarding and prefer that your actual phone number is used, at this point you have the option to specify that. The Advanced section allows you to do things like only run the extension for a specific time, or only use it during your business hours when you are available to take calls. Here you can also manage conversions (which is getting a bit advanced, so for most intents and purposes you’ll just stick with default settings here). Click save and then save one more time in the previous section (the number you just inputted will automatically be selected). Now you should see your phone number. Costs for a call are the same as the cost for a click. If no one clicks to call, you don’t get charged. Now if you’re like most small business owners out there running Adwords on your own, it can be very confusing. There are a lot of different settings. Hopefully this post helped to clarify the whole call thing. If you have any questions, I’ll meet you in the comments. Want to run Google PPC ads for your small business, but have no idea how to get started (or the desire or time to figure it out on your own)? Have ads going but don’t know if you have things properly set up? I’m here to help! Get in touch with me today.